So instead there was more creativity, and extra work on the book. The tissue at the top was given several coats of clear UTEE to build up a nice thick layer, and then the heat gun turned up full blast so that it melted and ran. Top Tip: keep your fingers out of the way, because when it drips it's not only hot, it sticks! A bit like cheese does when it's toasted. 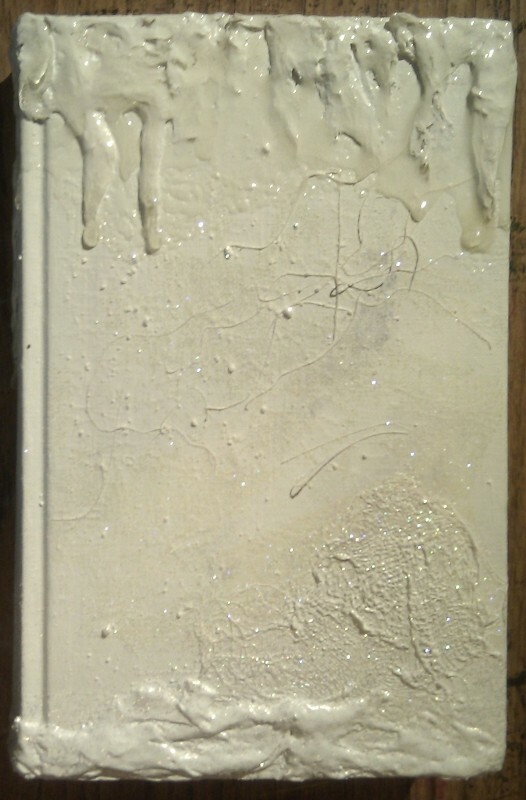 Once the top was finished, the bottom received a few layers of embossing - Winter Wonderland and Kaleidoscope, and then a dusting of Kaleidoscope to give some sparkle to the rest of the cover. Now that I've done all that, I'll cut a hole in it. Hmmmm.... Planning? Looking very cool. I'm waiting for the UTEE I ordered to arrive so I can start experimenting :). It is coming on nicely with the texture developing. UTEE is great stuff, very useful! Thought Winter Wonderland was your name for the book:) Then I realised! It is a very frosty scene you have created, a (white out) sort of winter scene. But we'll have wait and see where you take it. Don't you just love the first day of heavy snow when it is blanket-white, a white out?. Heavenly textures! This is one incredible book cover! the texture is worth the cheese burns I think.... this will be an amazing cover!!! The texture is really cool. I think that you could do some really great stuff wit that! yes I agree, cool texture. This looks very intriguing! I've learnt about UTEE only recently, but somehow, I'm still too scared of the heat gun thing and all. But I really like the texture, and I'm looking forward to see how you proceed with this!